"This basic dough can be filled with Empanada Pork Filling, then fried or baked." Whisk together the 2 cups flour, salt, and sugar in a bowl until evenly blended; make a well in the center of the mixture. Whisk the egg yolk and water together in a small bowl until smooth; pour into the well and mix to form a stiff dough. Transfer the dough to a lightly floured surface and knead until smooth and elastic, about 8 minutes. Roll the dough with a rolling pin until thin, sprinkling with flour to prevent from sticking. Brush with melted butter and roll it like a jelly roll. Cut with a sharp knife into 1 1/2-inch slices. Roll each piece into a circle and fill with about 1 tablespoon filling. Fold over into half moons and seal. Try lola's recipe for Empanada Pork Filling to make Filipino-style empanadas. 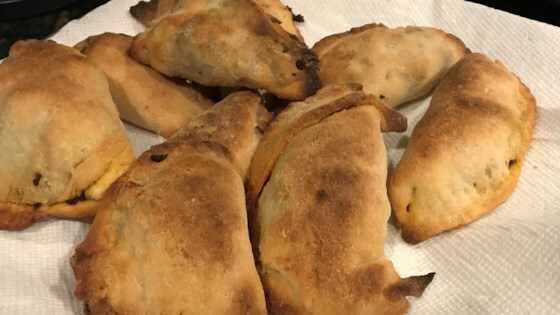 If baking the filled empanadas, brush the top of each with beaten egg white just before baking at 350 degrees F (175 degrees C) until golden brown, about 30 minutes. Good texture, but much too sweet. Would be good for banana empanadas. I used 1 Tb and 1tsp sugar. Had to add a little extra water. Took a LONG time to make. Turned out very good. Needed less time to bake the empanada, maybe about 25 min. it sucked.. dry.. not not soft or bread like at all.. not going to try this again..